Hell’s Kitchen is the hottest neighborhood for active residential construction in Manhattan, as we discovered last week. With more than 3,500 units currently under construction, the area is popping mid- to high-rises like daisies, or some other tall-ish, frequent flower. We take a look at the Hell’s Kitchen market, right here, right now. Most abundant unit type: Two-bedrooms, which account for nearly half of the units on the market. Stella Tower — The 18-story, 51-unit condo conversion was created by the same development team behind Chelsea’s famed Walker Tower. Located at 425 West 50th Street, the building was originally designed in 1927 by Ralph Walker and completed in 1930 for the New York Telephone Company. JDS Development Group and Property Markets Group restored the original Art Deco detailing and brick facade, while bringing back the crown that was lost in the 1950s. Cetra/Ruddy is the architect of record. Some of the apartments are under contract for more than $3,000 per square foot, which is unprecedented for the neighborhood. 540West — The condo project by Fortis Property Group and Wonder Works Construction Corp. consists of two interconnected seven-story buildings with 110 units total. S9, an affiliate of Perkins Eastman, is the architect of record, and Meshberg Group designed the interiors. Amenities include a 24-hour doorman, split-level lobby with fireplace, gym, two landscaped roof decks and a landscaped 6,000-square-foot courtyard with lounging, dining, outdoor cinema and reflection pool. Cassa Hotel and Residences — Located at 515 Ninth Avenue, the 12-story rental and hotel project was developed by The Chetrit Group and Assa Properties. The Cassa Hotel occupies the first through fourth floors, while the 108 residences span the fifth to twelfth levels. Goldstein, Hill & West Architects designed the milky white facade building, while “functional modernist” firm Raad crafted the interiors. Amenities include a rooftop sundeck with lawn and spa tub; residences will have access to the hotel’s lounge, gym and private storage, as well as the opportunity to purchase a la carte hotel concierge services, from in-room massages to housekeeping. 625 West 57th Street — Holding down the Far West side of the 57th Street construction boom, Bjarke Ingels’ in-progress pyramid will eventually rise 540 feet and hold 709 units. 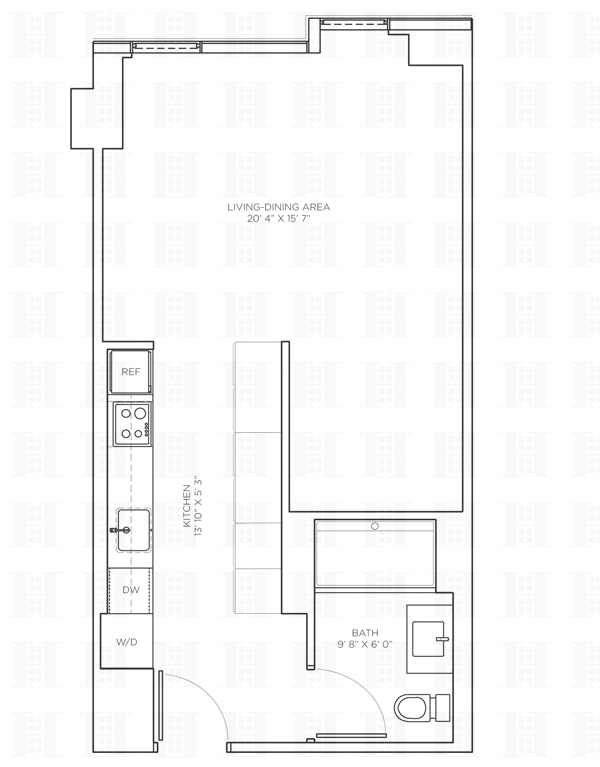 Developed by the Durst Organization, the building’s unusual, sloping shape combines the open space of a European-style courtyard block with the expansive views of a traditional Manhattan skyscraper. It won’t be completed until 2015, but the building already shows the trademark audacity of a starchitect whose website is www.big.dk. *We’re ignoring Hudson Yards, which is a whole other supertall can of worms and a neighborhood in its own right. For more Hell’s Kitchen developments, check out our map here.